As the human race developed, so are the toys. They are not for filling the time of children between their naps and feeding anymore. They now play an important role in the development of kids. 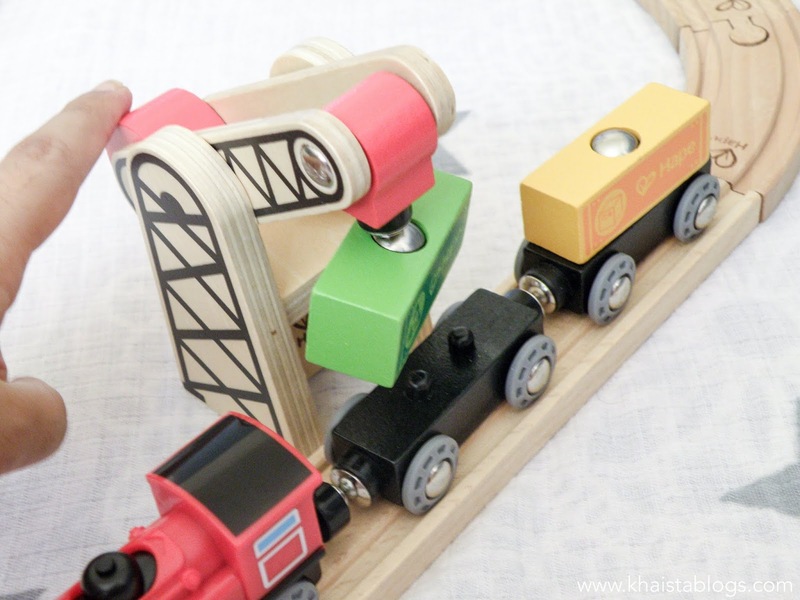 They help in hand-eye coordination, develop their senses and enhance motor skills. Toys also help in refining social skills, memory skills and stimulate concentration. 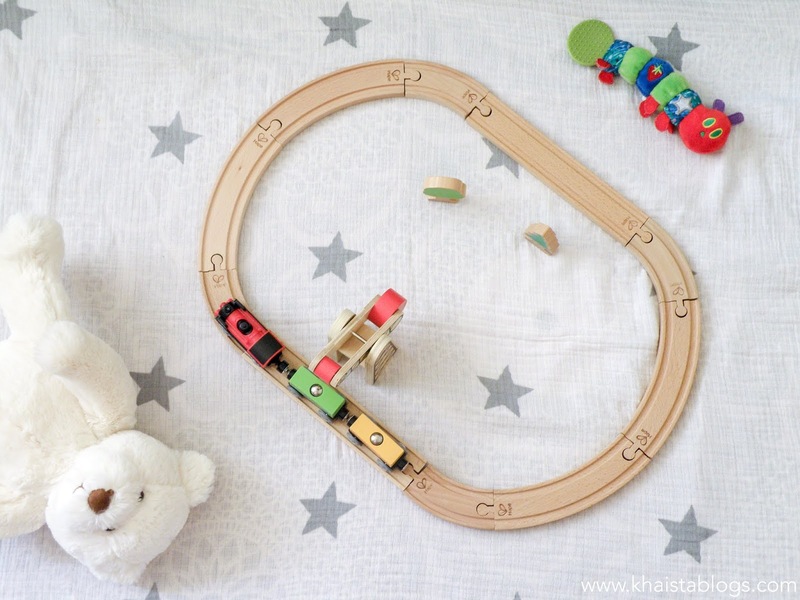 There are many toys to satisfy little ones curiosity. 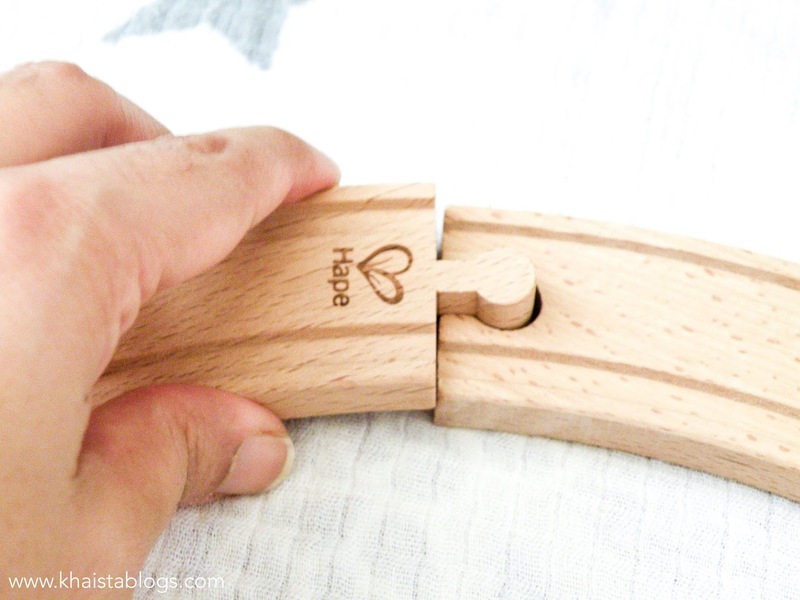 A good, well made and sturdy toy gives an extra piece of mind. I grew up with lots of toys – not that I was a spoiled one but I and my siblings have small age gap. I played with all sorts of toys. Dolls, cars, marbles, miniature kitchen gadgets, board games you name it, and so my brothers and sister. At the time they were just toys for us, but their effects are long lasting. I believe my exposure to broad variety of toys, irrespective of gender stereotype, made me a reasonable person with a lot more common sense and better social skills. So it is important to choose safe and right toy for a positive and constructive character building. Hape is becoming my favourite toy brand. 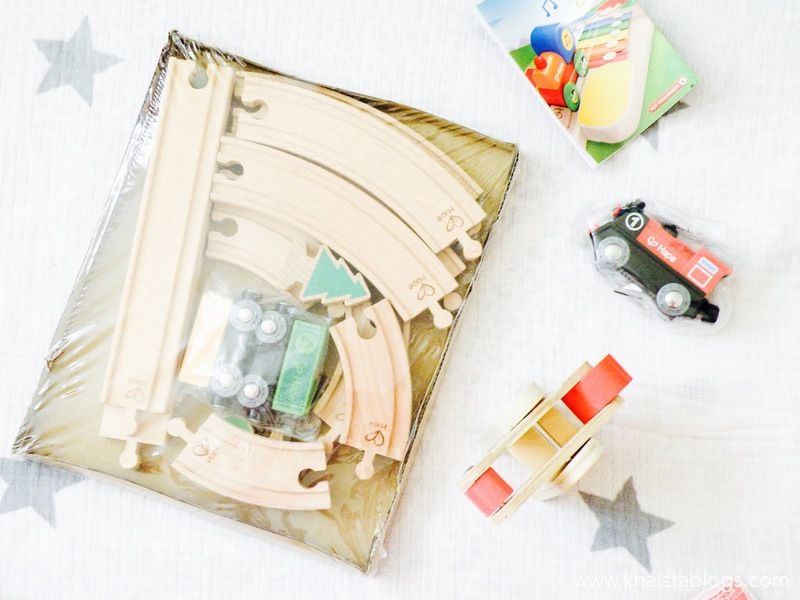 I was sent this beautiful battery powered (batteries not included) and colourful wooden train set (Model: HAP-E3721), available at Amazon. 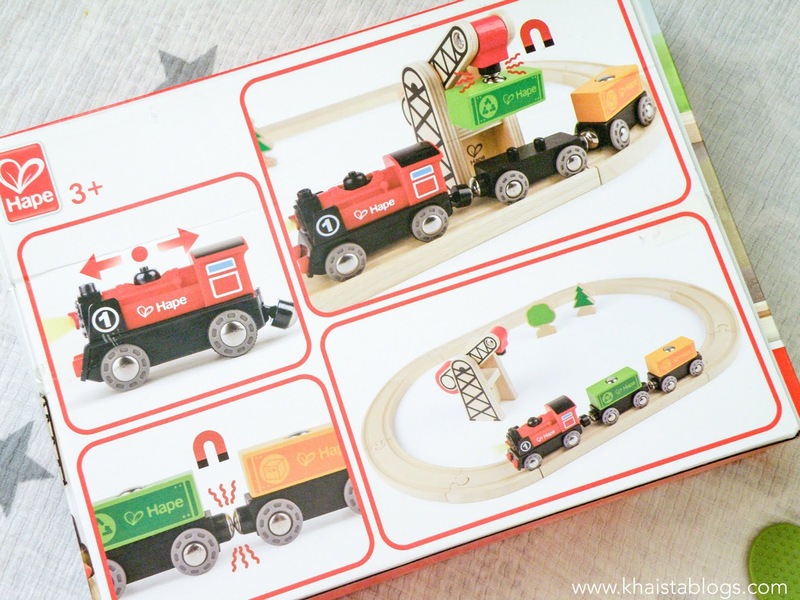 The box contains one classic looking engine, two carriages, crane, track and trees. The whole set, once displayed brought the railway scene to live. The set came nicely packed. 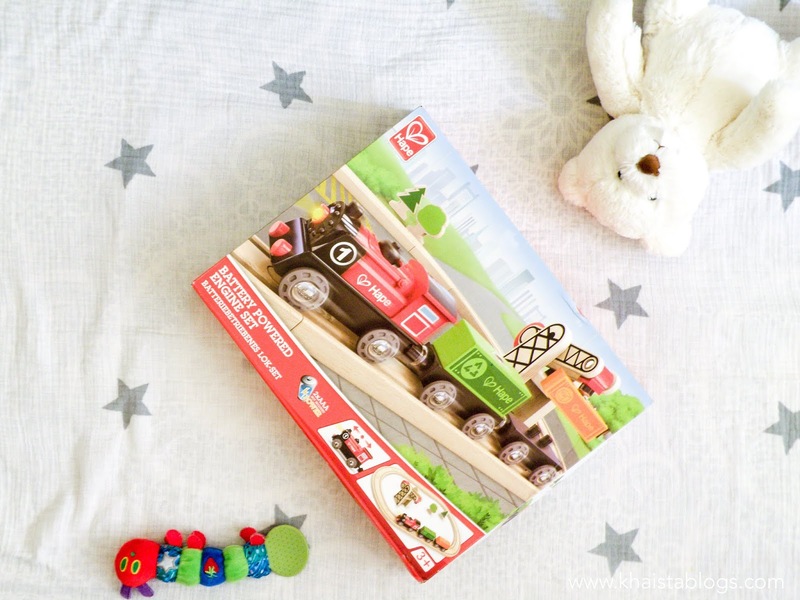 It will be a great gift too to bring smile on toddler’s face. Bright and bold colours catch child eyes instantaneously. 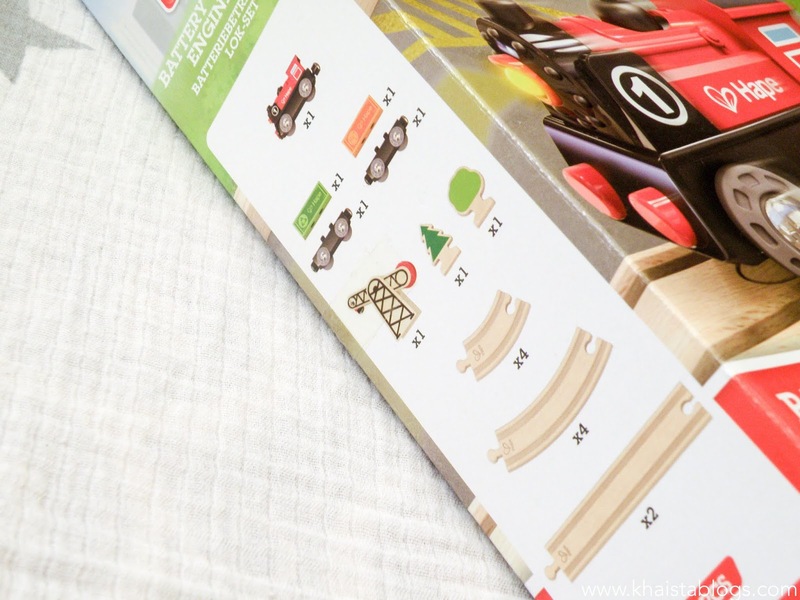 Track assembling itself is sort of a puzzle to stimulate brain activity and develop hand-eye coordination. Engine and carriages have magnate and they attached easily together. With a push of a button, engine can move forward and backward, pushing or pulling carriages. Crane also has magnate to lift the carriages from track, providing endless hours of fun to enhance imagination. My LO is very tiny to actually play with it but what I noticed was, when I assembled everything and let the train run on track, her eyes were following the train. Then she tried to grab the engine as it approached near her but failed as it moved forward. She tried second time and couldn’t but third time succeeded which amazed me that how beautifully she timed it. I am confident she will absolutely love it. This looks like so much fun! I used to love playing with my train set when I was younger. Hape has become our favourite toy brand too. This looks like such a great toy for little ones. My little girl would love this. I think my son had one of these trains a few years ago. I remember the train and track being well made. I love seeing my nephew play with his toys and become inquisitive as he learns about his toys and the world in general. I was always fascinated by moving toys when I was a child too! 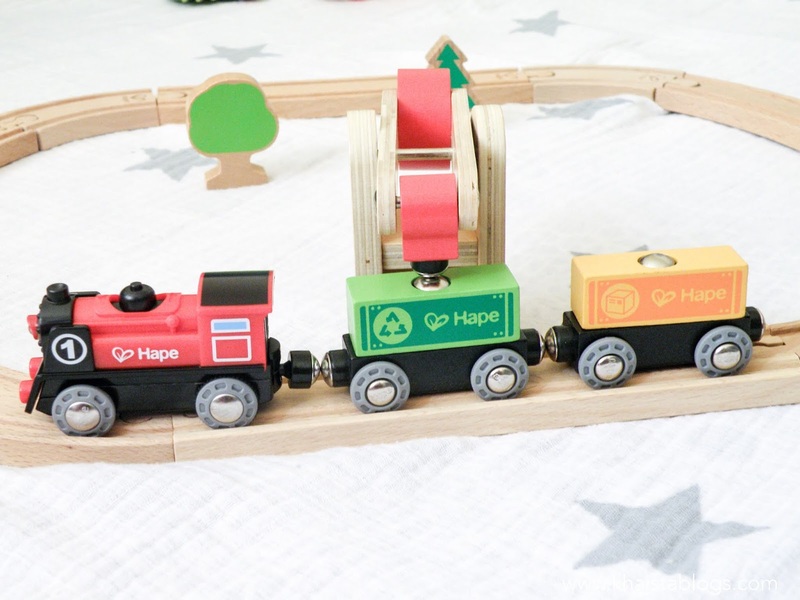 My son will definitely love this battery powered engine train. It looks really entertaining for kids.